Week 3 of Great British Bake Off 2015 was ‘Bread Week’ with the contestants starting off with a Soda Bread, before moving onto the technical baguette and then the more elaborate show-stoppers! 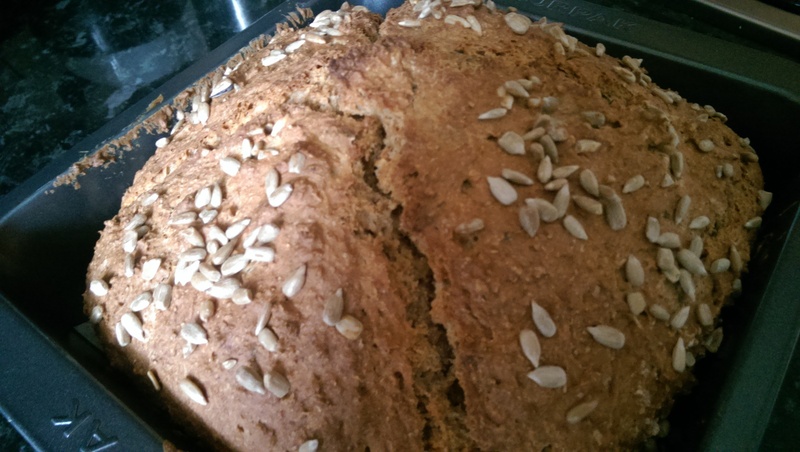 So naturally I started off with the easiest option of soda bread. Not a bred I’ve made before so I turned to my trusty ‘bread book’ Short and Sweet by Dan Lepard for inspiration. This cook book doesn’t have a huge amount of photos but more than makes up for this with tonnes of recipes! I once saw Dan Lepard showcasing his bread making techniques at a food festival so have admired his bread making since. An Aussie version of Paul Hollywood! The basis of this recipe is Dan Lepard’s ‘Breakfast Soda Breads‘ which recommends putting together the ‘dry’ ingredients and storing them for when you want to bake up some fresh rolls. Not a bad idea since I often struggle to eat bread before it starts to go stale. However this time I wanted to bake a whole loaf so I used the same basic recipe but added used some rosemary from my kitchen garden, then threw in some cayenne and chilli flakes for a bit of a kick! I also topped the loaf with some sunflowers seeds because they were closer than the rolled oats. The great thing about baking this soda bread is that there is no kneading and proofing involved, so it’s really a quick bread! Sift the dry ingredients together, so the baking powder and salt are evenly mixed. Add any herbs and spices you want at this point. Preheat the oven to 200C (180C fan-assisted)/400F/gas mark 6. Stir the required quantity of milk and yoghurt into your dry mix. Position squares of baking paper over each pocket of a muffin tray, then spoon about 150g into the centre of each. Gently press the mixture and paper down into the pocket. 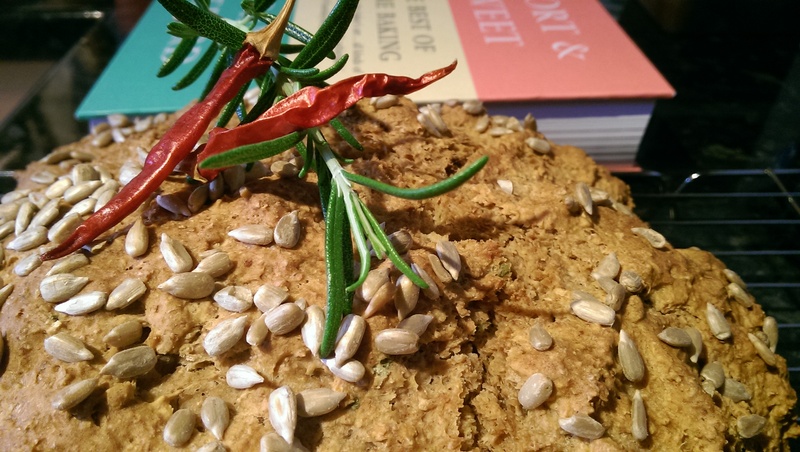 Sprinkle a few rolled oats (or seeds) over the soda breads and bake for 25 minutes, until puffed and brown. Serve warm. If baking one large loaf, then bake for 50-60 minutes or until done. I baked this loaf twice as the first time it was slightly under-baked in the middle, as I didn’t slash the loaf in the middle. The second time I baked it I added some extra rosemary and reduced the amount of salt but felt that the flavour of the first loaf was better. I think I’ll try other soda bread recipes to see how they compare!